Australian delegation brings warm clothes to IDF, Border Police, in Judea and Samaria, dedicates event halls to the tune of $71,508. 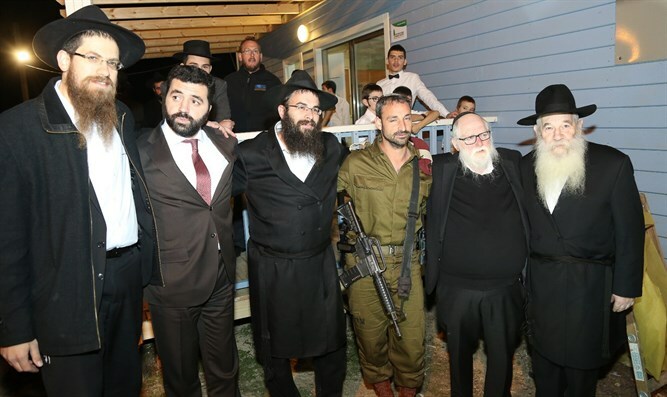 Australian Chabad philanthropist Saul Spigler led a delegation of 15 Australian Jews on a trip to Israel, to provide warm clothing to IDF soldiers stationed in Judea and Samaria, and to inaugurate event halls for them worth a quarter of a million shekels ($71,508). On Wednesday, the delegation visited several Border Police bases, held a special ceremony for the units, met their commanders, and heard about the challenges the soldiers face. The main event was held on Wednesday night in the Samaria town of Yitzhar, where a new event hall was inaugurated. The soldiers and commanders were very moved, and said that the gesture gave them a lot of motivation. They also gave the delegates a shield of honor for their generous gift. The delegates explained that they see great importance in ensuring the welfare of soldiers stationed in conflict-ridden areas. They also noted the great appreciation of IDF soldiers around the world, and that it crosses sector lines. The visit was initiated by "Light for Peace," a project spearheaded by the Melbourne, Australia, Jewish community during Hanukkah. For every person who uploaded a selfie with his Hanukkah menorah and tagged it #Lightforpeace, one dollar went to buy warm clothes for IDF soldiers and Border Police officers. Spigler, one of Chabad Australia's major philanthropists, enlisted a group other Australian Jews who believed in the project's importance and agreed to join it. Melbourne's Rabbi Dudu Leider said, "The secret of this project's success is that we used social media to strengthen Jewish identity and mutual responsibility among Jews around the world." "Jews in over 60 countries joined together in order to strengthen Israel's security and to bring Moshiach (the Messiah)."